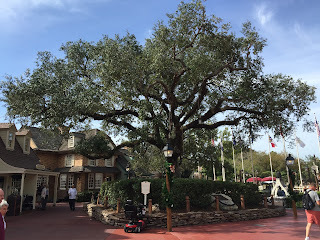 One of the overlooked landmarks in the Magic Kingdom is the Liberty Tree. A symbol of America's freedom, this 135 year old southern live oak contains 13 lanterns representing the original colonies. In the late 60s, this 35 ton tree was transplanted from a different location on property to Liberty Square, where it still proudly stands today. I took this shot yesterday, while giving a tour of the Magic Kingdom.